Students build a model insect based upon the genetic information provided to them. Gene forms (alleles) contributed by each parent are determined by tossing a coin with one side representing the dominant form and the other side representing the recessive form. Students note the geneotype and phenotype of each trait and then build the insect using inexpensive, readily available materials. Organisms inherit genetic information in a variety of ways that result in continuity of structure and function between parents and offspring. Hereditary information is carried in genes, which are composed of DNA. Each gene carries one unit of information. In sexual reproduction, typically half of the genes come from each parent. Sexually produced offspring are not identical to their parents. Genetic traits are passed on from generation to generation. Some genes are dominant, and others are recessive. There are two parts to this activity—one for children to do during the outreach event, and the other for children to take home with them. If Build-A-Bug is combined with DNA Necklaces, Build-A-Bug: Part II yields an updated DNA necklace. 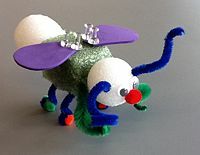 If Build-A-Bug is done separately, then Part II can be extended to create other crafts such as protein key chains or zipper pulls. Note: Each insect parent is heterozygous for all traits. Genes exhibit complete dominance; heterozygote's phenotype = dominant homozygote's phenotype. Designate which side of the coin (heads or tails) = dominant gene and determine which phenotype = dominant. Tell this information to the students. For each trait—big/ small eyes, curvy/ pointed wings, stingers vs. pincers, etc—each student flips a coin twice. Each coin flip = allele given by one parent. Students then determine and write down the genotype (ex: Ee for eyes) of each trait on their insect's birth certificate. Students then discern the phenotypes from the geneotypes and construct their insect using the provided arts and crafts materials. 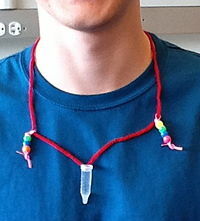 Figure 2.2: DNA necklace with beaded Build-A-Bug "proteins"
Objective: Make beaded "proteins" that determine the Build-A-Bug body part phenotypes and attach them to a DNA necklace. The DNA necklace will therefore represent the "central dogma" of biological information flow. Instruction sheet of body part phenotypes and the DNA sequences that code for them. Each "protein" should be composed of 3 to 5 amino acids. Brochure: to garner community support for synthetic biology and your iGEM team, of course! Use provided information sheet to look up the DNA sequence for each of the bug body part phenotypes. Copy down DNA letters on worksheet. Look up amino acids to go w/ each codon (3-letter mRNA group) in codon tables provided on the worksheet. Fold a piece of cord around the necklace strand such that the cord piece is divided in half. Keep the cord ends parallel and use them to tie a (double-stringed) overhand knot such that the cord is secured to the necklace but can still slide up and down the necklace strand. String both ends of the cord through the amino acid beads. Tie (single-string) overhand knots on the end to keep the beads from falling off. ⇒ Repeat all of the steps above to make a protein corresponding to each body part phenotype. The end product will be a necklace containing a vial of wheat germ DNA and "proteins" corresponding to Build-A-Bug phenotypes on each side of the vial.